Waiting for a service person or delivery at your home. Finding and working with a plumber, handyman, contractor or other service person. Taking your pet to the veterinarian or groomer. Taking your car in for service or to be washed. Returning items to a store or mailing back to a catalog. 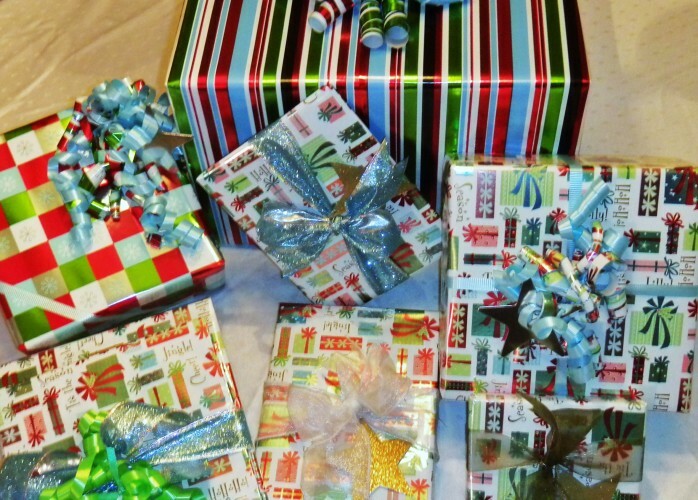 Handling postage and package needs, picking up stamps, packing boxes, etc. Making donation drop-offs of used items. Cleaning out a home or apartment after a loved one has passed away. Making a special recipe or meal. Meal-planning and recipe selection, followed by list preparation and shopping, if needed. Cleaning up and organizing the drawer, closet or room that you’ve been meaning to get at for months. Organizing your library. Clearing out hard copies of books available for free on your electronic reading device. Providing support and assistance as you de-clutter a room or your entire home. Weeding, pruning, mulching and caring for your garden with an educated eye. Providing plant selection and placement advice, including purchase and planting if desired. Special cleaning, gardening and organization projects outside the scope of regular cleaners and lawn-care providers. Helping pack and unpack when you move your household. Researching venue ideas and working with vendors and caterers. Planning decorating themes and carrying them out. Decorating your home for holidays. Writing a holiday letter reflecting your year and personality. Baking and cooking traditional recipes to provide homemade treats – your recipes or mine. Cleaning up and packing decorations after holidays. Checking in on your housebound family member. Driving you to and from doctor’s and dentist appointments and waiting as needed. Going shopping with you to finding another size of the garment you are trying on, give an objective opinion when you want it, or carry shopping bags at the mall. Pushing the cart and loading the trunk at the grocery store and helping unpack at home. Helping you hang artwork or make decorating decisions. Travel is one of life’s great adventures, but it can also bring a good deal of extra work. When you are traveling or having out-of-town guests arrive, wouldn’t you love an extra hand? Dropping-off and picking-up from the airport or train station. Taking care of your garden while you’re gone. Handling household tasks until you’re back including watering plants, putting trash out, bringing in mail and newspapers, taking care of pets, etc. Restocking your refrigerator and/or having a meal prepared when you arrive home. Creating a coffee table photo book of your trip on Shutterfly, Blurb, Snapfish, KodakGallery, etc. to capture memories beautifully. Preparing your home and guestroom before guests arrive, including special cleaning needs, flowers, meal planning, food preparation, etc. Serving as tour-guide to visitors when you’ve seen the memorials once too often or just can’t get off work. Responding to a call from your child’s school to pick him or her up in a hurry and stay at your home until you get home. Your car won’t start and you’ve got a deadline or critical meeting to attend. Your air conditioning went on the fritz during a heat wave but work obligations won’t let you meet the repair person. Taking you to the doctor. Picking up prescriptions and essentials at the grocery store. Making a pot of chicken noodle soup (or whatever other food would make you feel better). Keeping your household running while you get better. Helping with a variety of writing jobs – thank you cards, holiday letters, eulogies, fund raising appeals, newsletters, etc. Creating a book of family recipes on Shutterfly, Blurb, Snapfish, etc. Providing a professional editor’s eye for your project, newsletter, article or book. And more… If you don’t see your need listed, Alyssa’s Simple Solutions still might be able to help. Alyssa loves variety and working with all kinds of people. She’ll be happy to consider your errand, project or chore, large or small. 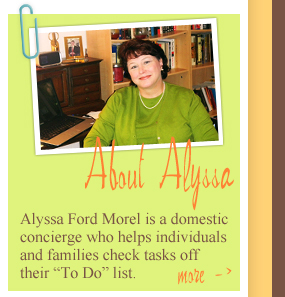 Give Alyssa a call at 703/907-9318 or send an email to info@alyssassimplesolutions.com.